The importance of wearing good running shoes for running. Whilst the wearing of good quality running shoes do not cure injuries, they certainly do help to reduce the risk of impact injuries associated with running particularly with those who are new to this very popular past time. More people than ever are now taking up running particularly on the back the Park Runs which has seen people of all ages, shapes and sizes turning up on a Saturday morning to run, jog and brisk walk with hundreds of others. 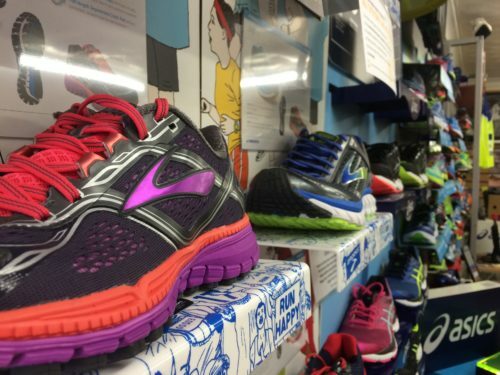 However, and whilst it is important to wear good footwear for running, it is also very important to ensure that when purchasing a pair of running shoes they are the correct type for you and therefore just as important to seek out a specialist running store which is staffed by experienced runners. We have a saying at Sportlink “We don’t just hear what you say, we feel what you say”. We also provide a very thorough Gait Analysis so as to be able to not only look at levels of pronation (the inward rolling of the foot upon making contact with the ground) or indeed under pronation, but we also look for other bodily imbalances which we feel could lead to issues and specific running related niggles. Once we have done this, road running shoes designed for training tend to fall into three different categories i.e. 1. Motion Control/Maximum Support 2. Structured and Guidance Cushioning and 3. Neutral running shoes for those who just require cushioning. These type of shoes are designed for the severe over pronator so as to slow down excessive pronation and inward rolling of the foot and will have been manufactured with materials which are slightly firmer along the medial section of the midsole commonly termed as dual density or even tri density so as to prevent collapsing of the shoe as the foot rolls excessively inwards. This type of shoe is probably the most popular of all as whilst it offers the more cushioned feel of the neutral shoe, it also provides a little bit of support for those that border on being neutral, perhaps have a degree of mild over pronation (sometimes just on one foot) and those who weigh in excess of 13 stone. Whilst these shoes do have a small post built into the medial section of the midsole, it is far less noticeable and prominent to that of the more supportive motion control shoes. Needless to say, neutral shoes are fully cushioned shoes without any firmer materials or posts built into the midsoles at specific points in respect of medial support allowing for a softer feel underfoot and a degree of more flexibility. It is also worth noting that many of the manufacturers are now producing some very highly technical single density materials which respond to the pressure of the foot whereby it will react under certain conditions and pressures negating the need for built in firmer materials into the midsole construction. For instance at the start of a run, we may be a little more up on our toes with a bit more of a spring in our step, but after a few miles the tendency may lead to a slightly reduced stride length and more impact around the heel area causing more pronation of the foot. So now we have determined the differences between the types of shoes, what does actually make for a good road running shoe when in many cases they all look similar on the shelves (albeit different colours). It is all to do with the materials which go into the midsole construction whereby they may all look very similar in terms of depth under foot, but some of the foams and specific technologies provide far more protection than others as well as holding shape retention for many more miles. 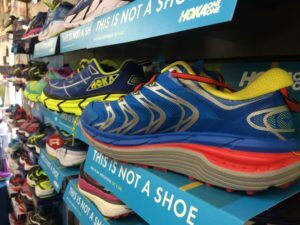 A few years ago if you went for a very lightweight shoe then the likelihood is that the shock absorption properties would not be very good and the shoe would be more suited for the faster runner looking for racing shoes. However, during the last few years, many brands have now produced lightweight materials which certainly do offer high levels of cushioning and shock absorption, but always ask the staff as to what has gone into the construction before buying a lighter weight shoe. Be aware that light weight natural shoes and those determined as Free Running shoes whist feeling comfortable will not always feel so comfortable after a few miles of running in them especially on harder surfaces. Also be aware that if you do try out a natural and minimal running shoe, the heel lift will be much lower than that of a normal training shoe for which you may well experience some tightness in your calf muscles and Achilles tendons until you are more used to them. Are certain brands better than others. Most people have their preferred brands, but all established running manufacturers have built up their reputation after several years of being at the forefront of producing high quality footwear with their own specialist technology designed to protect and give comfort for all those many miles of running. First and foremost, find out what type of shoes suit your running style and biomechanics best and then try all the brands on. The gait analysis will determine this and once you have done so make sure you get the chance to have a run on the treadmill and preferably outside of the store so as to get a true feel under foot with regards cushioning, comfort and support if required and then after trying them all on, hopefully one should stand out above all the others. If one pair feels better than the rest, then the likelihood is this is the shoe for you. Trail shoes are designed with deeper tread for more grip when running off road and on uneven surfaces and of course when also wet and muddy. The uppers are also likely to be more supportive so as to hold the foot in place and keep it stable when twisting and turning. For hill running the mid soles are also likely to be of a lower profile so as to reduce the risk of turning the foot particularly on steep descents. Many of the manufacturers are now producing hybrid shoes which enables the runner to mix up the terrain so as to take in off road and road sections during the course of a run. Only for the elite? Well not necessarily, but they are much lighter and firmer for which the emphasis is on speed and feel of the ground underfoot which means far less shock absorption and support. They are also much narrower just like a track spike so bear in mind if running longer distances your feet may swell a little and expand during the run. In truth, unless you are one of those runners at the front of the field or certainly weighing under 12 stone and determined to go for PB’s and feel race shoes will give you that extra edge, then it might be better to go for one of the lighter road running shoes whereby you can still retain the extra cushioning which will certainly be required in distances over 10 miles. Cost of Purchasing a good running shoe. The saying you get what you pay for is not necessarily correct especially if you have spent a lot of money on shoes which are not designed for your running style. As mentioned earlier in this article, it is all to do with the materials which has gone into the construction of the midsole for which we try to explain the differences between a very light fluffy foam and a more substantial foams and materials which will not only give more shock absorption, but will also last longer. However, this still doesn’t mean you have to spend hundreds of pounds to get a high quality running shoe. At Sportlink, we suggest that if you spend somewhere between £70 and £100 then you can be fairly confident that you have walked away with a shoe which should give you at least 500 miles of comfort, support and protection from the impact forces of running. Most importantly the word comfort is always the most important box to tick as what is the point of purchasing a shoe that tick all the specific boxes, but still don’t feel comfortable. Running is simple and a pretty natural past time and once into it, most people tend to get hooked. There are lots of running gadgets and brilliant accessories on the market, but always remember it is the shoes on your feet which is the most important part of a runner’s equipment. One final foot note: - Running Shoes are designed for running. To use them for other activities will cause abnormal wear and break down to the uppers and midsoles.